–Hannah is an enigmatic, talented young lady. 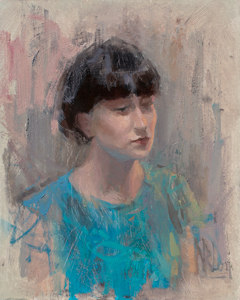 We met when I gave a talk at her Art College and she is now launching her musical career with the band “Dream English Kid.” The two small paintings of Hannah below have already sold and the top one was shown at the Mall Galleries, London, in the New English Art Club Exhibition. 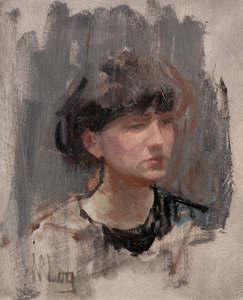 The painting of the week presents the relaxed, contemplative Hannah, very different to her stage presence. The armchair, fireplace and decorations were set up in the studio to give a domestic feel. 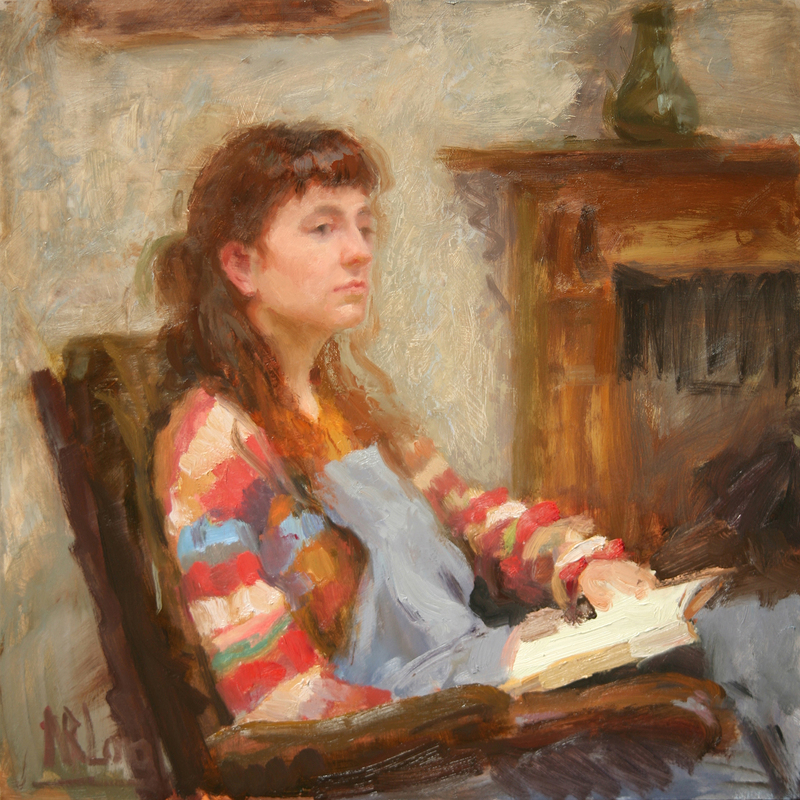 The title refers not only to a section of the book but to this transitional period in her life after Art school. Norman Long’s most ambitious painting to date. ––Newly married and enjoying long beach walks near our home in Lytham St Annes, this monumental painting records my contemplation of a future life together. 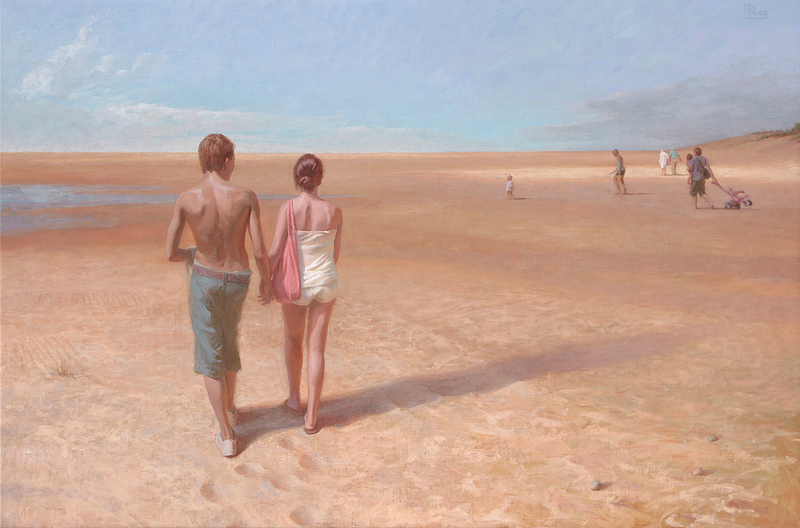 The young couple, actually based on a photo I took on honeymoon in Venice, look towards the middle distance, where as parents they are busied with children and responsibilities. 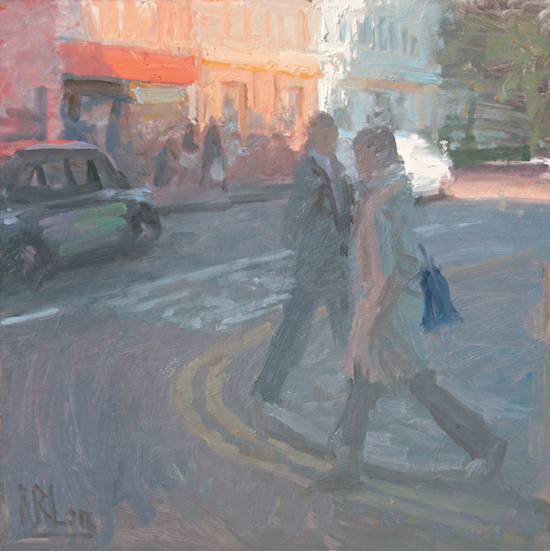 The sunlit far distance is where they once again walk side by side, reflecting upon the distance they have travelled together. The canvas is the largest dimensions that would fit on the studio wall. 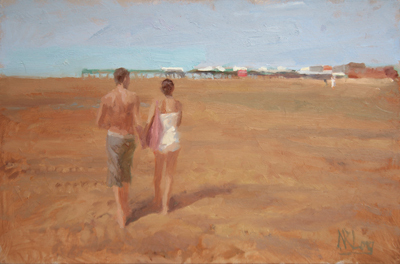 The setting is based on many drawings and small studies (like the one below) done on the beach. As you can see, St Annes pier once featured in the painting but was distracting from the true message so was painted out. 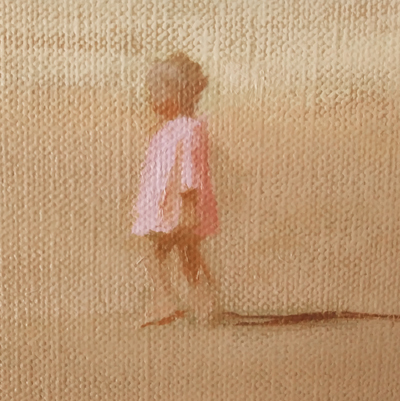 The little girl (below) in “Going the Distance” also appears, albeit walking the other way, in “Divided Interest”.